NYC, 02/08/2019, 2:00PM. Loving Vincent (2017): an animation biography of Van Gogh. 94 min. Directors: Dorota Kobiela, Hugh Welchman. Starring Douglas Booth, Jerome Flynn, Robert Gulaczyk. 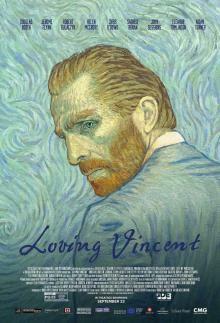 Each of the film's 65,000 frames is an oil painting on canvas, using the same technique as Van Gogh, created by a team of over 100 painters. It won Best Animated Feature Film Award at the 30th European Film Awards in Berlin and was nominated for Best Animated Feature at the 90th Academy Awards.